Ruggeri Valdobbiadene Superiore Prosecco DOCG is a multi award winning prosecco. Ruggeri are one of the top five Prosecco producers inItaly. Ruggeri Valdobbiadene Superiore Prosecco DOCG is bright and bubbly, fresh and creamy yet balanced, this smorgasbord of white flowers and peach explains why. The vineyard is located within the delimited D.O.C.G. production zone, on the hills of the first Dolomitic ridges in the northern part of the Province of Treviso. The harvest takes place in the second part of September. 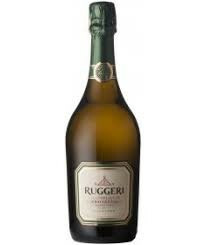 Ruggeri Valdobbiadene Superiore Prosecco DOCG is perfectly enjoyable on its own or with oven-poached fish in olive oil, warm asparagus and prosciutto salad or Thai spices shrimp salad with Asian greens and pesto dressing for example. 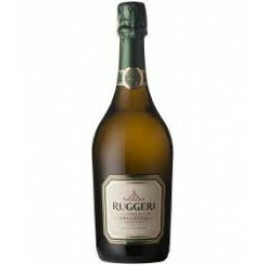 Ruggeri Valdobbiadene Superiore Prosecco DOCG is an exquisite lighter alternative to Champagne. Made from the Prosecco grape, this sparkling wine from the Veneto, Italy, is elegant with fruity apple flavours which make it a lighter alternative to Champagne.